The last couple weeks have been rather unproductive for me, but I have been trying to get some client obligations out of the way. My other half has been home for the first 2 weeks of (good God) what I think is a 4 week medical leave. He makes being a work-at-home business owner a very difficult task. The concept of "make yourself scarce" between 8am and 3pm AND be quiet does not make sense. Consequently, I have cried a lot, and gone for drives so that I can scream and yell in silence. Never the less, I have tried to work through a few client obligations so I can get closer to loading one of my own quilts. I am still a few days off because I forgot I needed to order batting (and likely silk thread too). Here's a Neimeyer star quilt I did a couple weeks ago. It's not the first of these I have done, but I have to say I'd be a happy quilter if all batik client quilts could go this easily. Usually this tighter woven fabric causes all sorts of unpredictable issues. Not this time. I used several threads, but dangit if I can remember what they were!...Probably Glide and Polished Poly if I had to guess. All features are SID with monofilament, then the detail work was added. Here's a quickie and cutie baby quilt my California client Jan sent me. I have done a dozen or more baby quilts for her. It couldn't be simpler, but she lets me play. I varied up the fills and then stuck in a couple of little birds, just for fun. I forgot to mention we got a new kitten. She is 6 months old and arrived to us last weekend. Miss Luna (named by my daughter Sophie) is a total sweetie. She's oddly fascinated with the computer screen. My husband noted that his screen said "...ssssssssssssdddddddddddddddddddd" and he didn;t know why. Tee he,. silly man. One last client quilt just finished yesterday... She sent me a photo of this done by someone else, and I varied a few things. It is quilted to be cute yet expeditious and budget conscious. I think I captured the quilt's features. 'For those of you fortunate enough to be in Paducah...know that I am realy envious. I just hate that I am not there this year...with my book release and my quilts there. One of them has a 1st place. The other just cannot ribbon. Don't know why!?! Oh well, life goes on. My AQS book is now available! Join me in a happy dance!!! I couldn't be more delighted to make this announcement today. I am tickled to finally be able to show this and know that the books are really in existence! Yes, printed with real ink. Somebody asked me that last week at MQX, and I found it particularly amusing (though it feels like it was partially printed with my blood, sweat and tears). 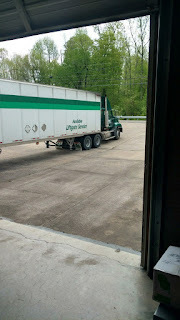 I spoke with my editor at AQS yesterday, and my book officially arrived to the Paducah, KY AQS warehouse yesterday from the printer. It was news to me that AQS does not actually print anything. They are editors, not printers so I am told. Either way, the book is here!! The actual book cover is slightly different from the image shown above that I was sent many moons ago. I really like the teal better than the navy blue anyways, as it pulls nicely from the color in the quilts. 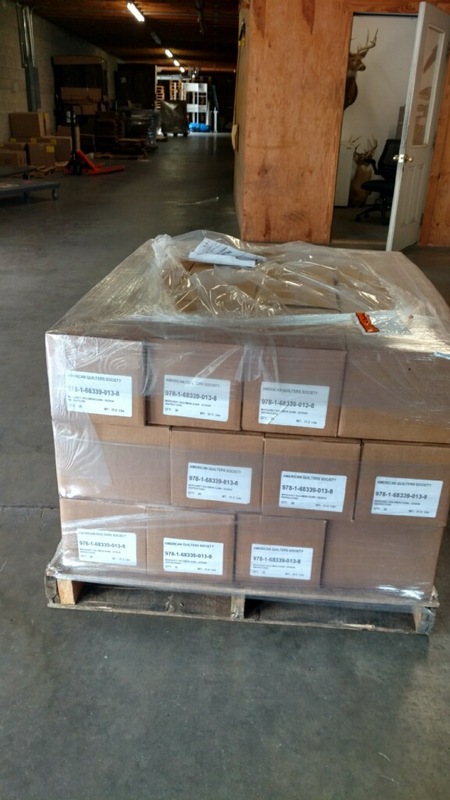 Here's one of the pallets in the warehouse...that is all books. I suspect that there are many more pallets too. And the truck that delivered them. I know, this is a boring photo, unless you are my very excited editor. The books will officially be at Paducah. It kills me that this is the one year that going to Paducah just cannot be swung. Even if I could somehow disappear for 2-3 days, I's probably never find a hotel anyways. So...if you are going to Paducah and see my books in the AQS shop, please send me a picture. With the Paducah show next week, and all of AQS busy with that production, I knew ordering books would be on hold until after the show. So....I placed an order yesterday which will be arriving to me this Friday! Yes, as in 2 days from now. 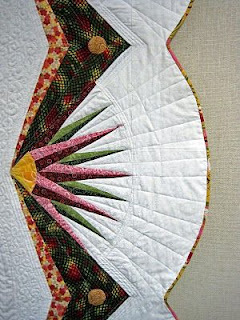 I have started preselling this book on my website MainelyQuiltsofLove.com today. If sales continue, I may have to place another order before the end of Friday. For the curious, this book was envisioned to be different, conceived before the end of AQS publishing. 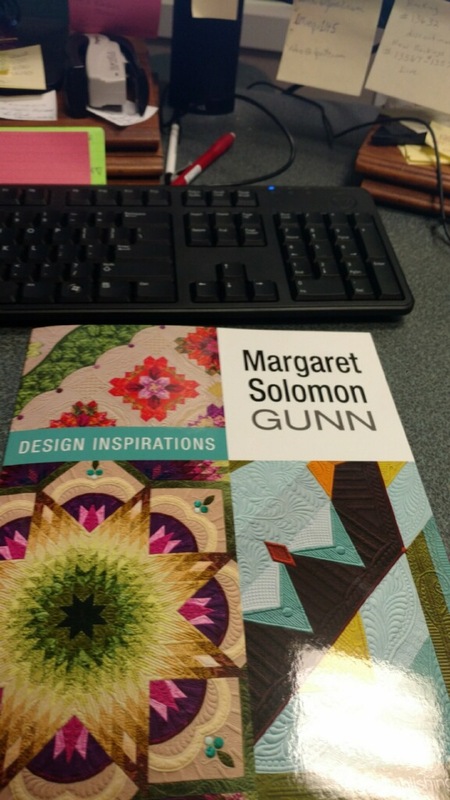 In all honesty, I think they were planning to print other quilters' stories in books similar to this one, but as it turned out, I am the only one. It has more information about me, the quilter, how I got where I am, and insight into my journey. I discuss the design process for each of the well known show quilts that are on the cover too. Each of these quilts are completely patterned within the 160 page book. 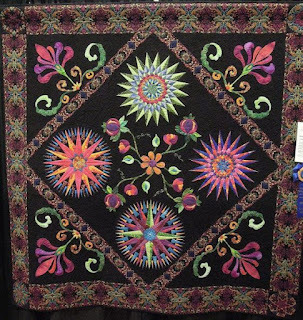 There are also details on key quilting motifs and techniques. At the very last minute, and after a bit of a grumpy standoff by me, they also added a dozen pages of closeup photography showing the quilting details. This was truly of immense importance to me, and made me very pleased when it happened. 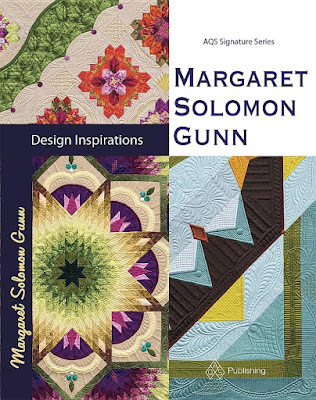 If you'd like to get one of the first of these books, visit my website MainelyQuiltsofLove.com. I am back from MQX, and have been quickly thrust back into the real-life of a mom and wife. No rest for the weary I say. For those of you that went to the show or are on facebook, you already know that my quilt "Taking the Unmapped Road" shown 2 posts ago actually brought home two immensely amazing and BIG awards. 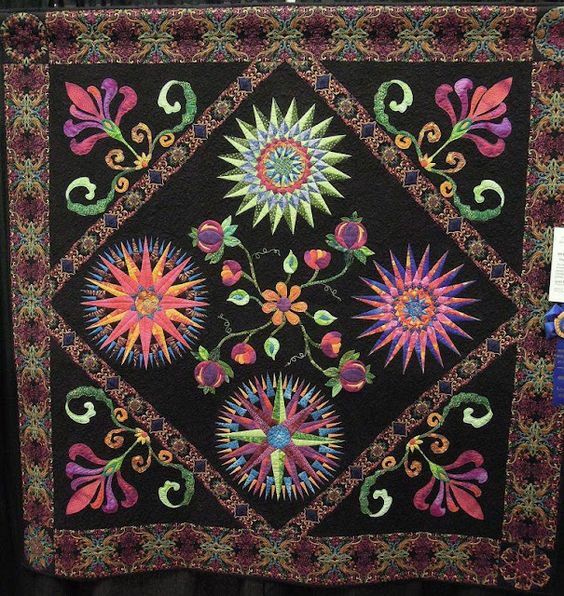 It won the best longarm quilting as well as Best of Show. I was more than blown away - so surprised on many levels. 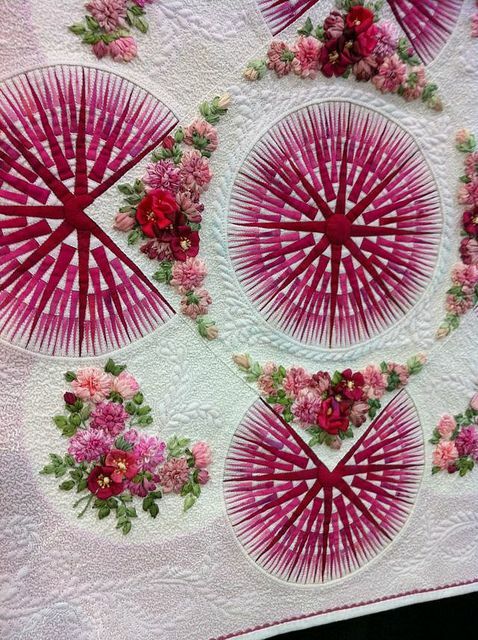 The quilting world continues to surprise me at every turn. 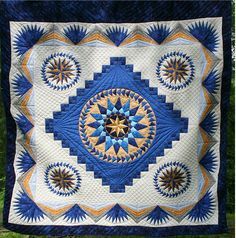 Quilts that I swear are say better don't do quite as well as I think they will. 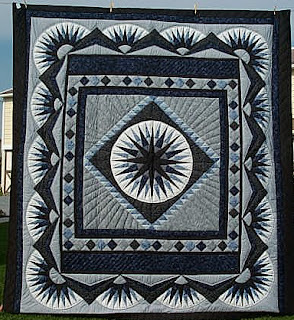 As for this quilt, I really did not see these huge awards coming. Happy?...absolutely. Surprised - that too! It was great to talk with Linda McCuean at the awards. She was one of the 3 judges this yr. She is the one I consulted many years ago when I decided I wanted to put a scalloped binding on Big Bertha. 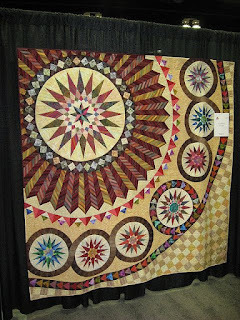 Big Bertha was my other quilt to win BOS at MQX. Linda is a phenomenal quilter; so inspirational to see her and thank her for what she has meant to me. With that zebra shirt, we should have met when The Twisted Sister unveiled! I came home and dove head first into the backlog of client quilts I have. This is an adorable "redwork" Halloween quilt. The Halloween theme is subtle. I quilted a crosshatch across the embroideries using a monolon nylon thread. This is just perfect because it looks just like a white thread, but shoes nothing on the embroidery. The quilting is light so as to keep the quilt still soft and snuggly. Sashings are quilted with a red Omni thread that matched the red of the embroidery. The quilting on the black border was in a bolder green that pulled from the outer plaid. Like I said, the Halloween theme is subtle. On the last day of MQX, I did a fun talk about getting kids into quilting. It was late on the last day, so the crowd was small, but they were dedicated listeners. My mom and daughter were there too. 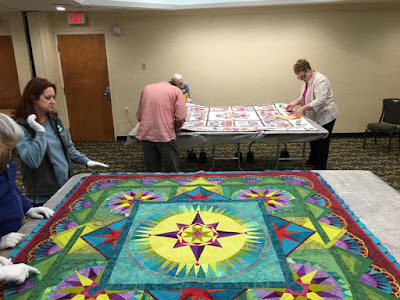 I spoke to quilters about each of the 4 quilts I have done with my daughter, 3 of which have now won 1st place here (much to my surprise, she won 1st again this yr!). I showed all of her quilts and gave my take on how I have inspired her at each age to learn how to sew and to quilt. 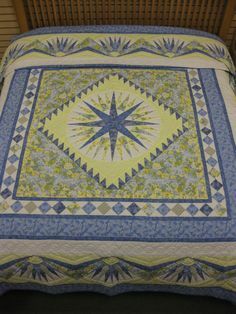 Mariner's Compass Quilts - Is there really an original one out there? 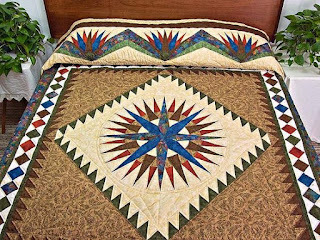 I've had discussions with several of my quilting buddies about exactly how original a quilt based on a well known and traditional pattern can be. One person is hell bent on accusing me of stealing her pattern. I still denounce these claims. My quilt is my own personal creation. I'm not getting into name giving here, and have no intention of making my blog anything but a dignified place of education. 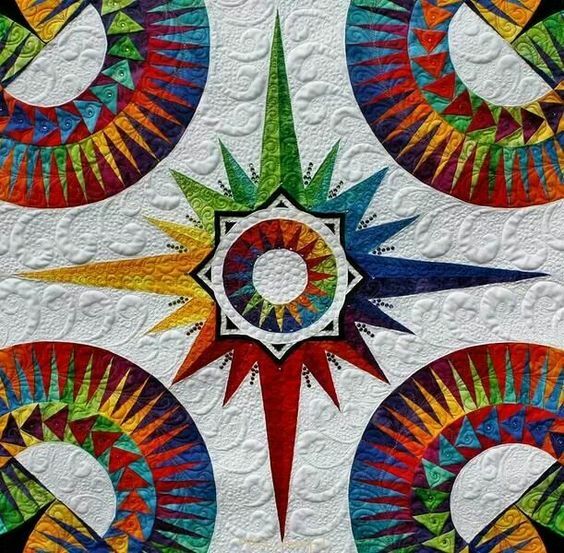 While my quilt reflects my sense of design and color, you can see how very many interpretations have been made by scrolling through some photos. This is a mere small sampling of thousands of photos available too. My apologies to the makers for not placing any credits. 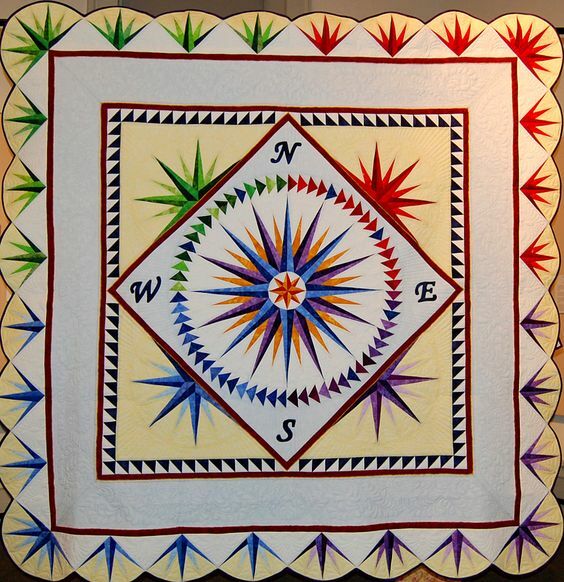 I found these on pinterest for the simple task of showing that a mariner's compass quilt can be executed in many ways. 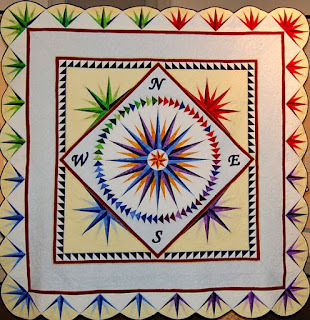 Like most of my quilts, the mariner's compass is often seen in a medallion setting, with a series of spiked corners and borders. The center star may have many spikes, or it may be of a simpler compass design. Placement of the New York Beauty blocks around the border is well, not immensely uncommon. 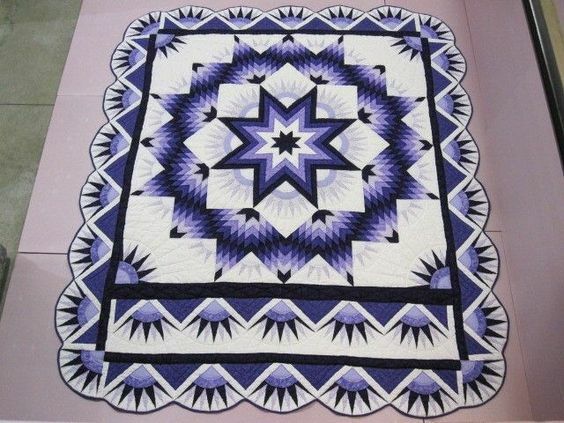 I never found a quilt with my particular center star because this was my design. The colors of my quilt were of my unique choosing too. If it appeared to have been stolen, well, the judges that saw it last week would certainly have been the ones to have called it out. They would have known. So really, when working with traditional patterns that have been made for over a hundred years by quilters around the globe, there really is no purely original quilt. They are all adaptations, with small details that make them unique to the maker. Meet my newest show quilt. I call her "Taking the Unmapped Road". It is currently at it's first show, MQX. At the time I wrote this post, judging had not yet taken place. By now, though, it is judged and it's fate is sealed. I will find out on Wednesday evening if it ribboned or not. This quilt is over 2 years in the making. That is mostly by my own procrastinating though. The quilting was nearly finished (all but the outer red border) 15 months ago. 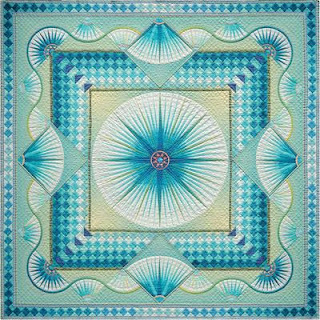 At that point in time, I was accused of stealing this design along with many of the quilting motifs -- a threat that is completely untrue. I have enough integrity and design abilities to do this my way. I got so mad, I boxed it up for a year and finished The Twisted Sister instead. 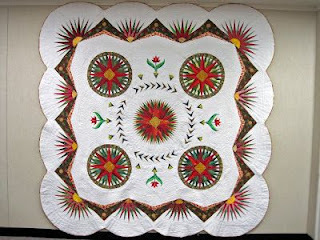 The quilt and I needed a cooling off period so that every time I looked at it, I was not reminded of the accuser. I think the judging coordinator likes to get my heart racing. She posts a photo from during the MQX judging for most categories. This is not the first time one of my quilts has popped up during judging on facebook. I think that my Solo category is the last one being judged. This popped up on my facebook feed - I nearly fell out of my chair. It was initially entered in Custom Heirloom Show, which has a larger size requirement, but had to be moved to Solo because of the number of entries (not enough). I really dislike this because Solo and Large Wallhanging are often large groups, and CHS is not. Boo Hoo. Sure hope that the judges like most of it when the take a closer look. This quilt is an original of my own design, created using EQ7. In October of 2014 when I started it, it was conceived merely as a "filler" project. I needed something mindless to piece. I was just finishing Bouquet Royale, and I was tired of every detail. I wanted something simpler. In all honesty, I loathe paper piecing, but it's the best technique to ensure pointy triangles. There was a LOT of semi-mindless paper-piecing on this quilt. Somewhere in the mindless process, which was supposed to keep me from feeling invested in the project, I decided I really loved the quilt. The colors were vibrant and powerful, and they were drawing me in. It is hard to see from the photos, but there are a few silks, and the more chartreuse greens are almost luminescent. This past fall, after Houston, I resurrected the quilt. First order of business was to remove the quilting of the red border. I never liked it, and had a new plan to try. This new idea was a one-shot deal - there would be no removing this if I didn't like it! No risk of that, though, as I totally LOVED the effect. It was different for me, but it looked great. 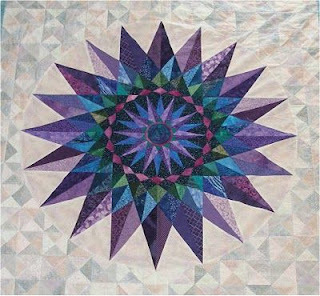 This quilt has many things that represent change and growth as a quilter. 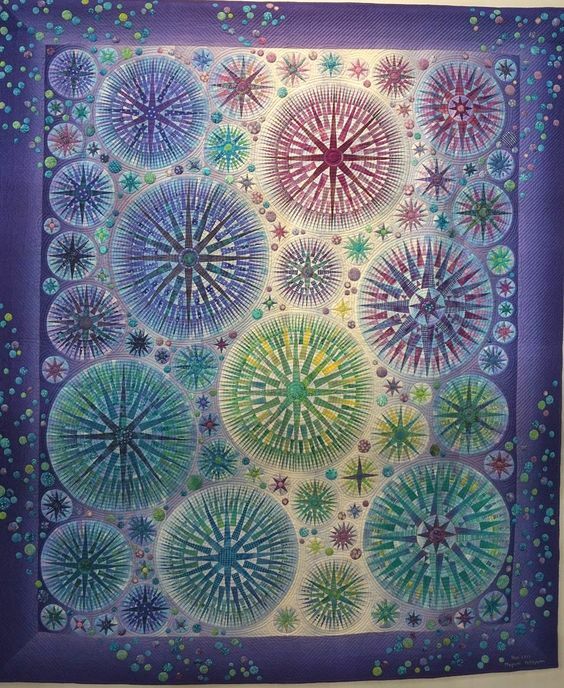 I hate seeing quilt after quilt by the same artist, and being able to know who did it before I see the card. Some people's quilting signatures are always the same. I strive to expand my abilities, to try different designs, to keep people thinking. I know many are now thinking I am the one that will mix the fussy-cut cottons with silk (and that is fine, as I so love this look!). But this quilt is a little different, as the name implies. This quilt was the last quilt I did on my old Fusion. It was stitched with both 40wt poly threads (YLI Polished Poly, and Glide) as well as some silk in the super dense fills. I used a Hobbs wool/cotton blend batt with another wool batt on top of that. It has good loft in unquilted areas (but we all know I quilted it nearly to death). As late as a couple weeks ago, I was still hand appliqueing a metallic bobbin thread to certain areas on the top, just for a tiny hit of pizzazz. It is hard to just stop, and declare the quilt done. There is some color infused purely with thread, as in the red above. Here's some very teeny-tiny matchstick quilting in a great herringbone design. It makes a wonderful effect. 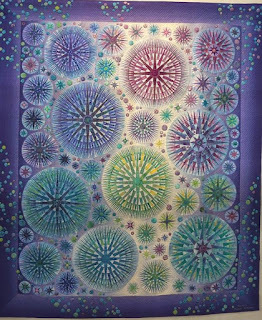 I finally got the nerve to paint this interconnected scallop border in late January. I had to mix the colors to get the right shades. THAT was nerve-wracking. Hindsight tells me I should have appliqued these, but I didn't even have these scallops on the radar until I designed the quilting. THEN I got the notion that they'd look good colored. Go figure. The binding treatment is of my own conception. 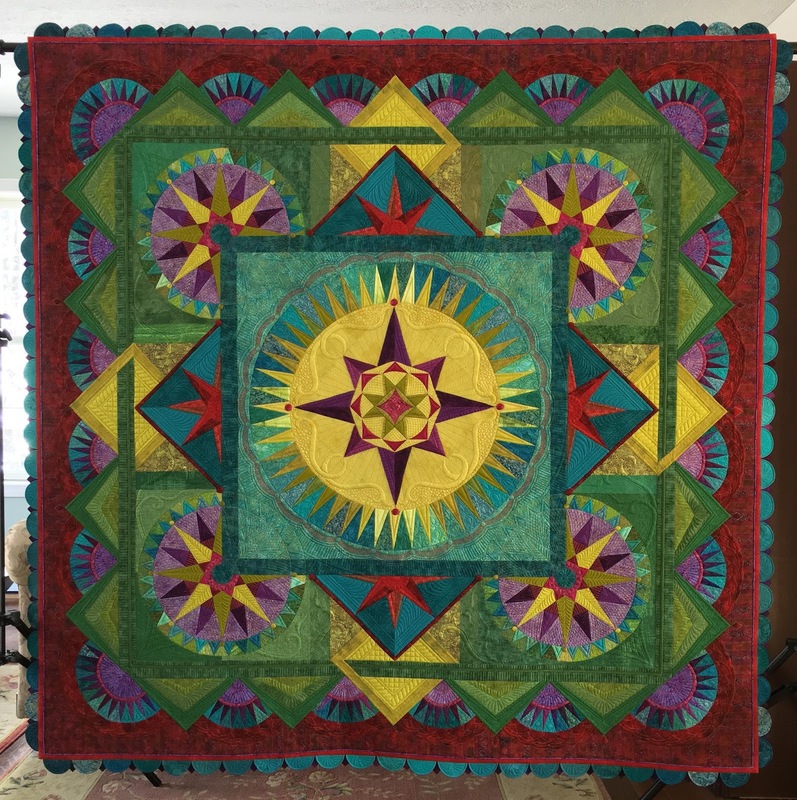 I am not a fan whatsoever of prairie points, but I envisioned this quilted scallop-prairie point contraption as an extension of the outer row of NYB blocks. It was finicky, but not as hard as I thought. Each of these 3" scallops was initially quilted on my longarm. They were then cut out and turned with another backing fabric on the DSM. This sounds simple, but much experimentation on how to do this so that a beautiful, smooth-edge scallop resulted. I wasn't going to do the edge treatment any other way. The purple prairie points are done the typical way. Putting this edge all together, with the piping took a few genies and a whole lotta magic potion, but it was all done on the machine, except for hand stitching the facing on the backside. 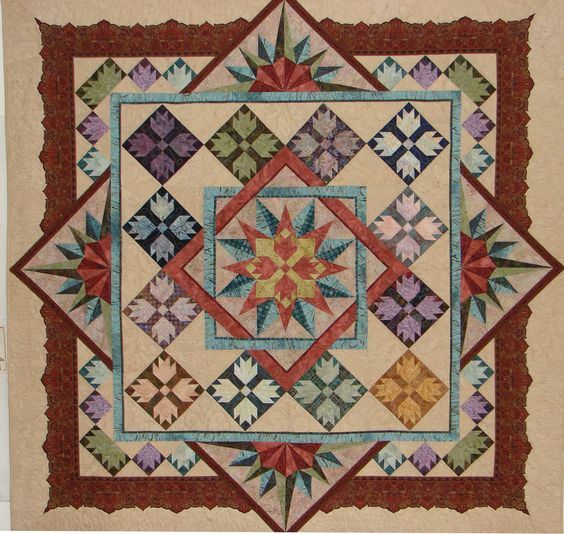 Stay tuned for an article later this year in Machine Quilting Unlimited on how to make this. And so we are done with the pretty pictures. As I write this (it's only Saturday), I wonder if it will earn a ribbon, and I wonder if viewers will enjoy looking at it. To me it is much more. It is a 2 year journey beginning with choosing fabrics at the Hershey and Houston shows. 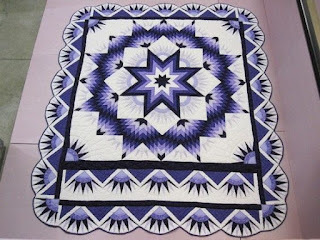 It is a calming, cooling time for me to do simple piecing, without an end result really in mind. 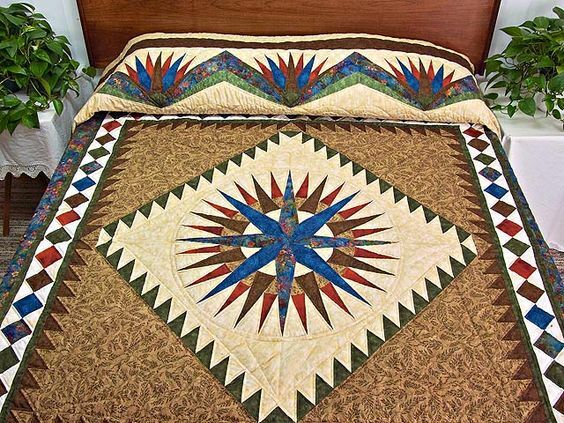 This quilt was kind of designed as the blocks were stitched -- hence the "unmapped road". The binding without a plan falls into that uncharted territory as well. Just because I didn't know where I was ultimately going, and did not have a well-layed out route initially, in no way should imply that I was not going somewhere. Remember, friends, the journey of how you get from conception to completion is what you will remember in the end. Take time to wander, for it does not have to imply that you are lost. This may have spent a year in a box. I believe that on some small, secret level, the quilt needed me to move on, do something different so that I could return back and finish this with a bang!